Single facer creates fluted medium and binds it to flat liner, forming single - face corrugated board. It is designed for continuous operation. It produces high quality board regardless of variations in grade, weight and caliper of medium. Mill-roll stands, feed, medium and liner paper into the single facer, which passes through the heated flute rolls and gets corrugated. The Corrugated medium passes over a gumroll for application of adhesive. The liner paper and the fluted media meet at the nip and these are permanently bound and then wound in rolls. Corrugating rolls are heat treated alloy steel. They have substantial walls, uniform wall thickness and maximum heat transfer. Each roll is milled for uniform flute profile. The upper roll is grooved at equal spaces and lower roll is straight and even. 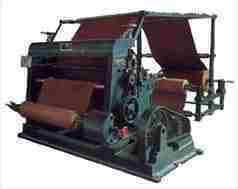 Pressure roll is ground to ensure uniform pressure which can be adjusted according to the paper requirement. 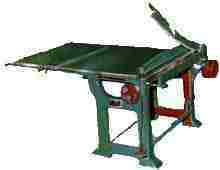 This Machine is hand operated to cut the paper or corrugated boards. 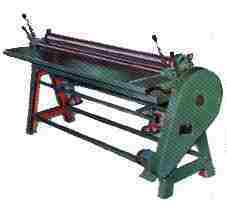 The paper or corrugated board roll is mounted on reel stand and is unwound to cut into sheets. It can be placed next to corrugated machine for cutting board into sheets. 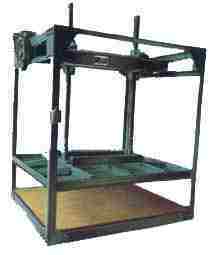 This machine has cast iron frame, for operated pressure clamp and front & back guides. Cutting blades are made of knife steel. 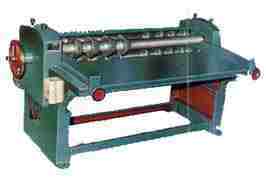 This machine finds its use in the application of glue on tips of the corrugated surface of paper or board. It constitutes of glue applicator, Glue doctor and a Feed roll. The applicator roll revolves in the glue and carries the adhesive, layered evenly by the doctor roll. The third roll which rotates freely feeds the boards. The gap between the rolls are adjustable and the glue pan be raised or lowered to adjust the glue level. Glue can be completely drained by removing the pan plug. The sheets which are processed on the pasting machine, are evenly set on this machine. Wet glued sheets are piled over the lower plate. By lowering the upper moving plate and optimum pressure is applied. Keeping the pile pressed between the lower and upper plates, the sheets are set straight. By reversing the switch, upper plate is moved up and the pile is removed. Thereby the sheets are set straight and even. The machine is sturdy and uniform compression is maintained all over the surface. Cutting and creasing are the initial processes in the manufacturer of a corrugated box. This machine consists of two pairs of shaft. The first pair carries the cutting dies and the seconds pair carries the creasing dies. Both these dies are made in two halves, for easy removal from the shafts. By means of a hand wheel the two lower shafts can be raised or lowered. Seperate guage of creasers can be used, depending upon the thickness of the board.